Nearly two years ago, Grace, Dave and I placed a group order to Legio Heroica miniatures to get the figures we needed to make crusader-era Saga armies. 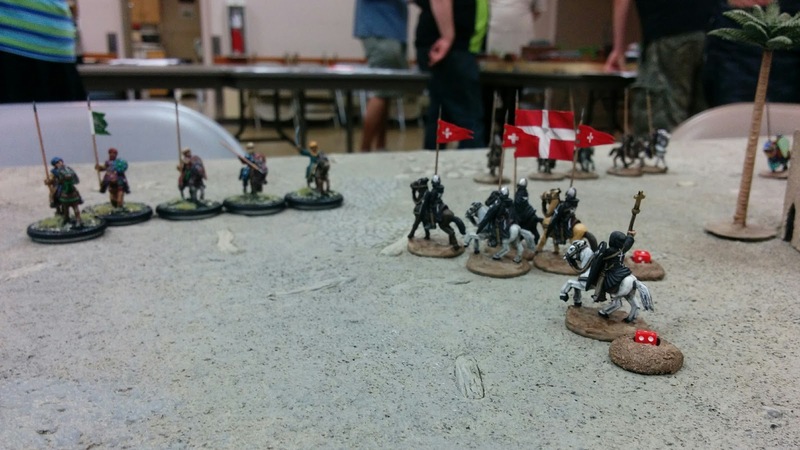 Last night, we were able to get all three of our armies on the table together for the first time! 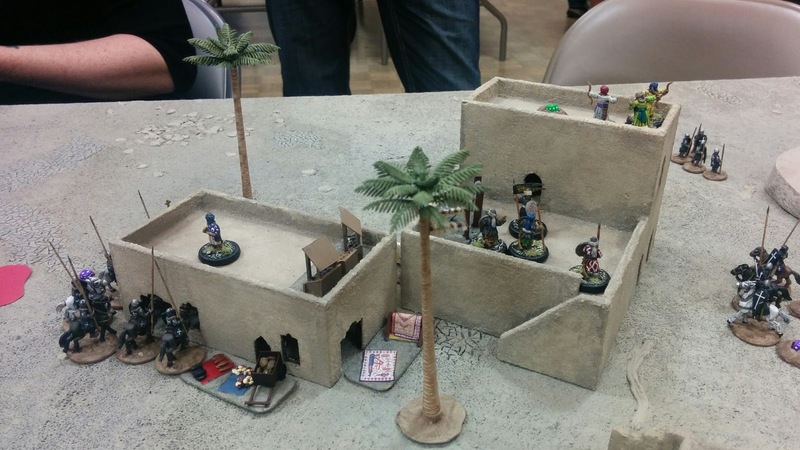 The scenario we chose was Last Stand, wherein the victory conditions are simple: if there is a single non-Warlord figure left of the defender's side on the table at game end, the defender wins. The slaughter must be complete! The attacker uses the Endless warband rule, meaning they can recycle their dead figures into new units, which can arrive from any table edge. Which force is attacking and which defending is decided by bidding: the side that thinks they can wipe out the enemy army in the fewest number of turns is the attacker. We both bid the same number, seven, though, so we rolled off and the Hospitalliers were the high roll, and thus the attackers! 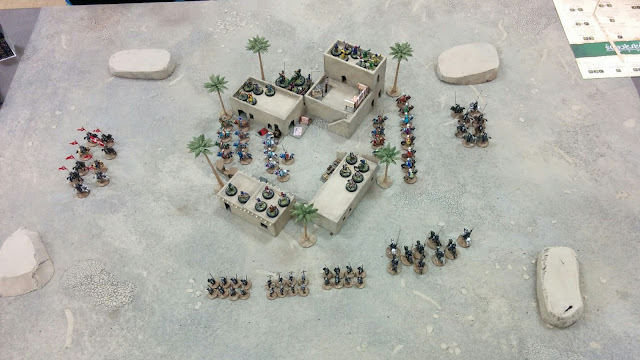 This caused some consternation on the Saracen side, because Grace was playing Mutatawwi'a, and most of their Saga abilities depend on sacrificing figures, something she was reluctant to do when each dead figure brought me closer to victory! I had my own problems: I was playing an 8-point force against Grace's and Dave's 4-point forces, which gave me a lot of figures to use, but it also meant that I would have a hard time activating my troops: I only got the same number of Saga dice per turn that Grace and Dave each got individually, meaning I couldn't move all my troops each turn, and I couldn't afford many dice for Saga abilities. 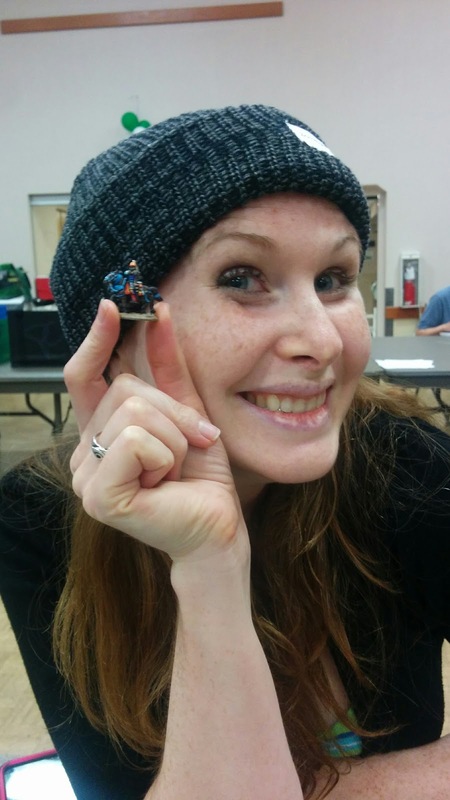 Grace and Dave deployed first, and I had first activation. Dave had a group of eight archers on top of the tallest building (North in this picture), so I decided to ignore that side and focus on the other directions. I brought my combined Hearthguard unit, with the Warrior Priest, in from the west, a unit of mounted Sergeants in from the east, another unit of mounted Sergeants from the southeast with my Warlord, and my three units of foot Sergeants from the South. On the Saracen turn, Grace charged my Sergeants in the east with her mounted Warriors unit. The battle was a draw with two casualties on each side. There was some other adjustment of the troops, mounted units of Grace's and Dave's coming around from the north to engage. Besides that, not much action in the first turn. In the first turn, the attackers generate no Saga dice, so each unit gets one free activation to move onto the table. 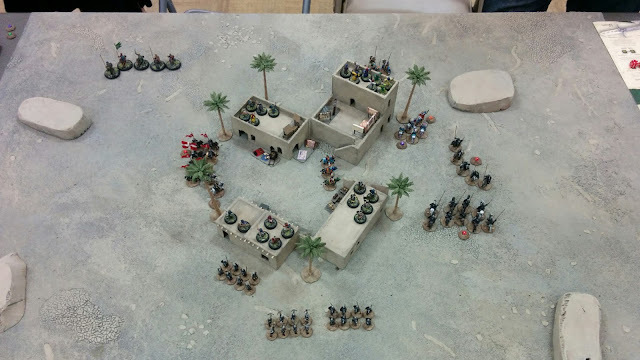 Starting in turn 2, though, I rolled Saga dice as normal, and I was able to drive forward with my big Hearthguard unit, led by the priest, and engage a unit of Saracen warriors guarding the west entrance to the compound. All but 3 of the Saracens were killed. 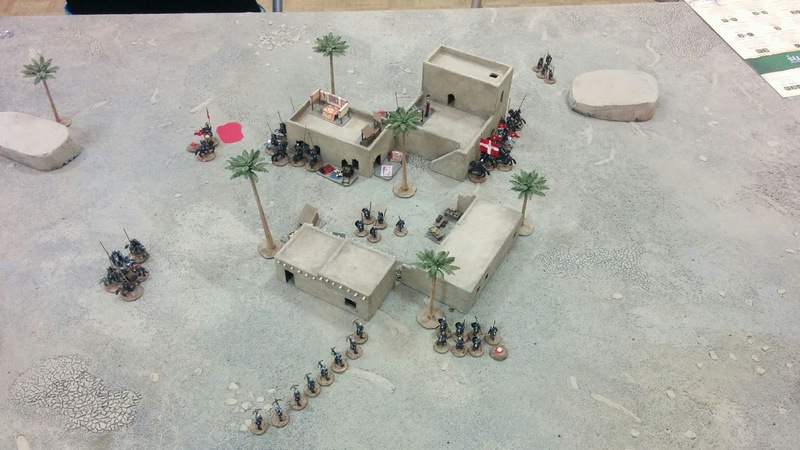 In the east, both of my units of mounted Sergeants were able to engage and destroy the rest of the Saracen warriors. At this point Grace and Dave had a little conference, and the Saracen turn was mostly about running away to the North with their mounted Hearthguard units. 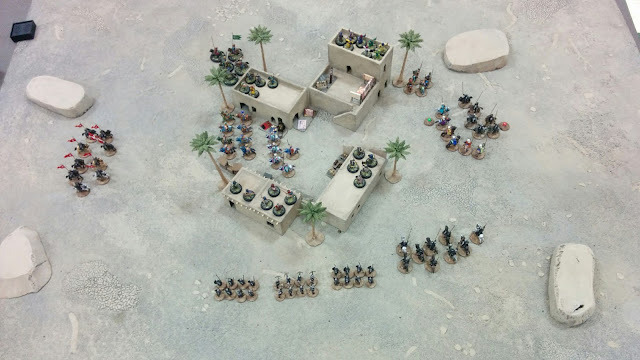 I wasn't too concerned about chasing them: when I had had enough figures killed, I could just create a new unit out of the dead guys and bring them on wherever the Saracens had fled to, so there weren't many good places to hide on the board. 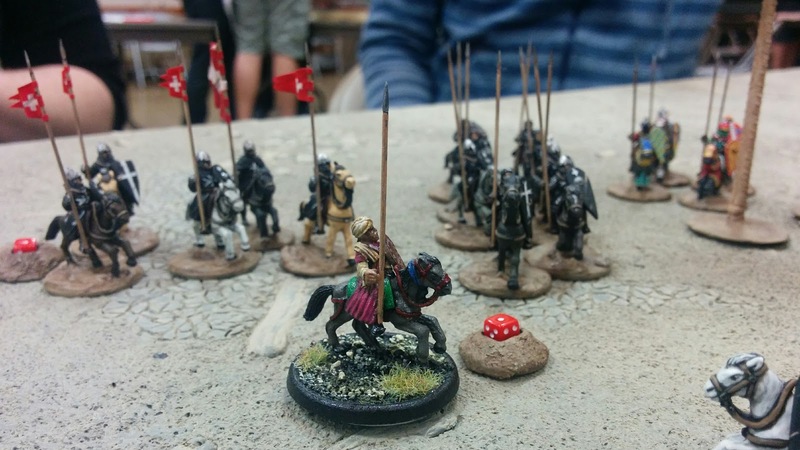 I mostly neglected my foot troops for the game, since I needed to use my activations on the mounted troops to chase the Saracens around. I was able to assault one of the buildings with Saracens inside, though it didn't go very well for me. 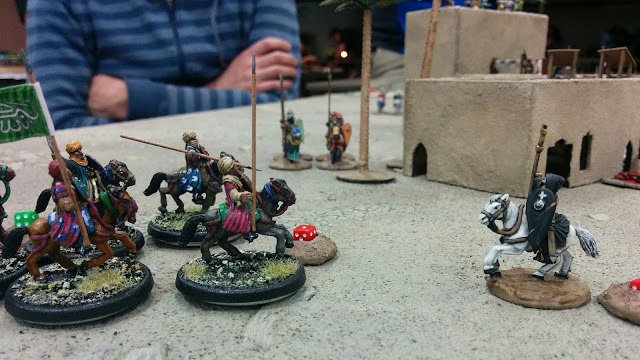 Meanwhile, my mounted Hearthguard were able to clean up the Saracens lurking in the northwest house. 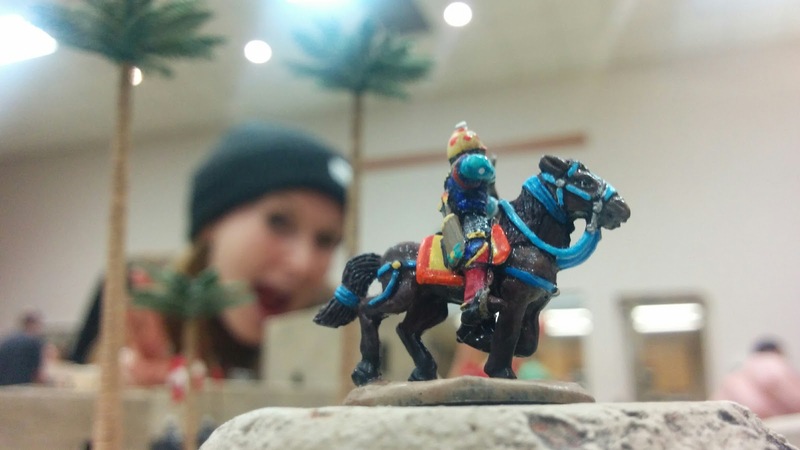 Meanwhile, in the East, my mounted Sergeants were able to beat up on Grace's "princesses", her mounted Hearthguard on matching white horses, leaving only one alive to flee with her warlord. 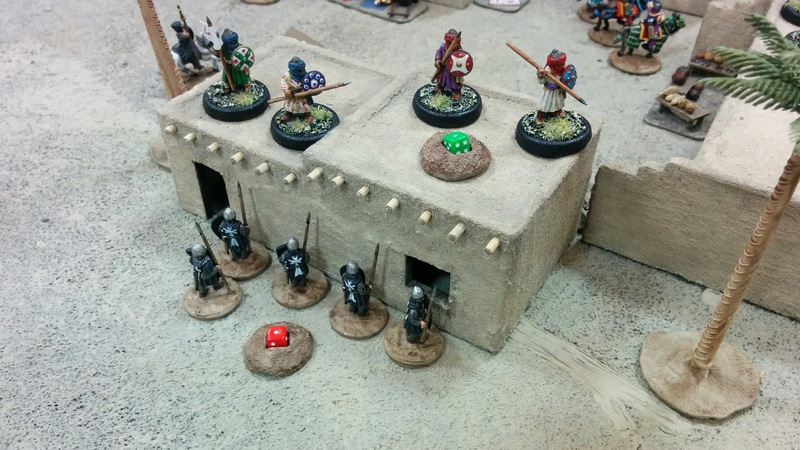 Dave's archers shot some holes in my Sergeants in the east, and they mounted an ineffectual charge against the building. I turned the attention of my (now half-strength) Hearthguard unit to attacking Dave's mounted Hearthguard in the northwest corner, but he was able to use some sort of sneaky Saracen ability to cancel my priest's action, so they ended up just standing there, looking like idiots. Then, in the east, the charge of my Sergeants against the house full of archers was disrupted by another, different Saracen ploy and they ended up just running around the north side of the house (where they are hidden from the camera and from where I was sitting, so I mostly forgot about them after that). I put together a unit of Hearthguard and a small unit of Sergeants from my dead guys (you can see them at the top of the picture), but I didn't have the activations to use them this turn, so they went back to the graveyard. 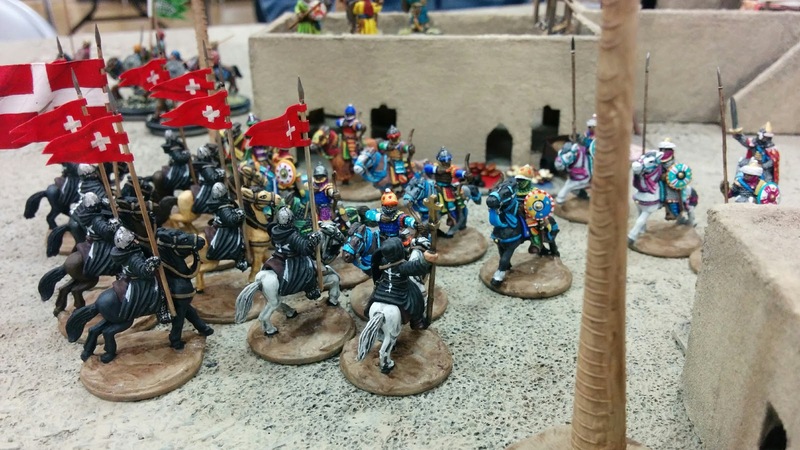 The Saracens continued their policy of evasion, forcing me to chase them around the table. 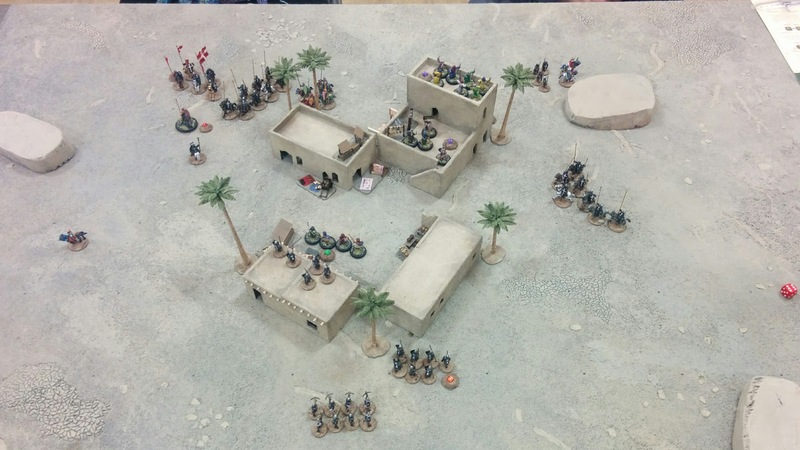 End of Saracen turn 4. 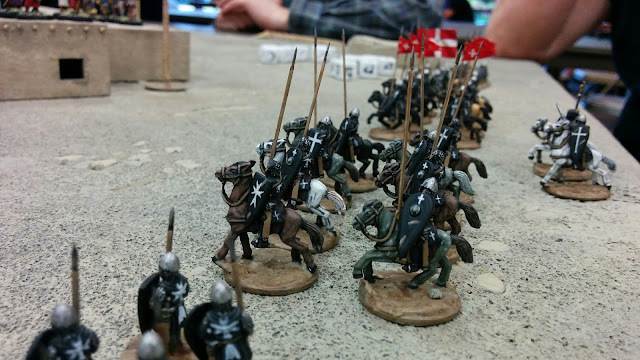 My priest and the remaining Hearthguard were finally able to come to grips with Dave's mounted Saracens and wipe them out, but at a high cost. After that fight, I had enough dead figures to bring in some new units. 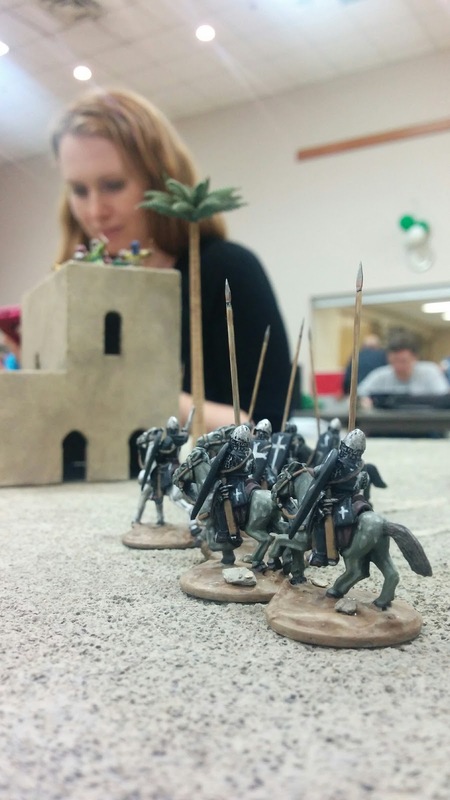 A fresh unit of Hearthguard from the northwest corner was able to finish off Dave's mounted Hearthguard, while some mounted Sergeants tried to attack Grace's warriors but were stymied by more Saracen trickery. In the northeast, I was able to jump Grace's one remaining princess with some resurrected foot soldiers, but they weren't able to finish the job. 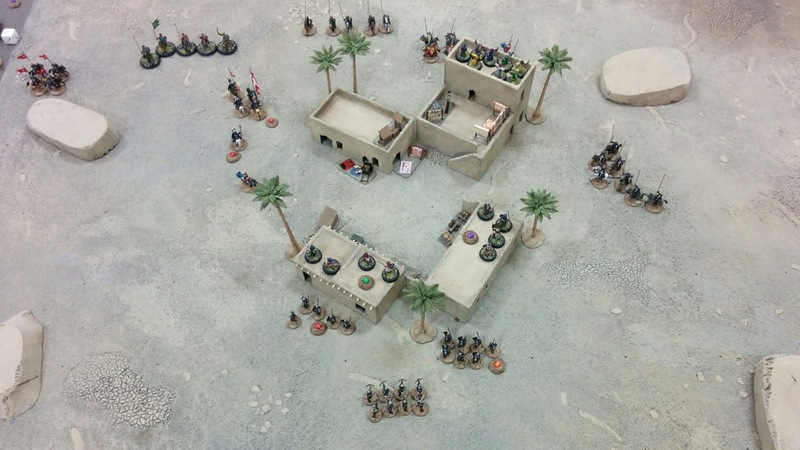 In the south, Dave's foot abandoned the buildings and fled across the courtyard to the buildings in the north, chased (slowly) by my own soldiers. The one remaining horseman from Grace's mounted archers unit that I smashed in the second turn ran through a gap and fled to the west, alone. End of Saracen turn 5. The victory conditions required the attacker to destroy all non-Warlord units. This means I didn't have to kill Dave's leader to win the game, but there were still good reasons to do so: first, deny him Saga dice; and second, because he's a big jerk. I turned my Hearthguard unit to the task, and a lot of them died, but Dave's leader was finally dragged from his horse and put to the sword. There was some fairly ineffectual back-and-forth among the houses, while I arranged my crossbow men to start hemming in Grace's lone horse in the west, and her single hearthguard and her leader ran around the hill in the east. 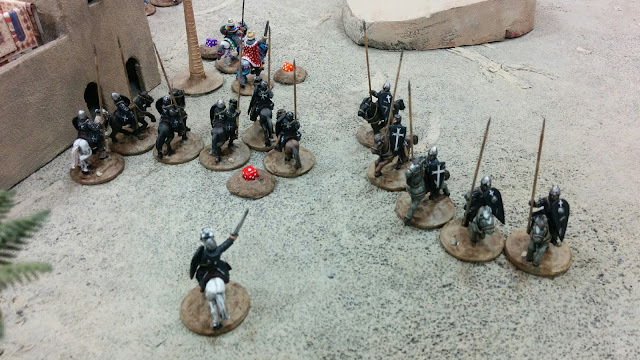 End of Saracen turn 6. So I had my work cut out for me in the final turn. 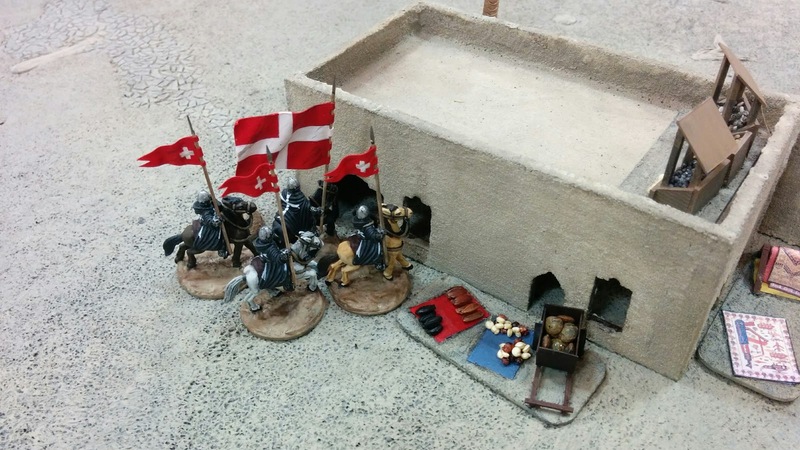 Most of the Saracens were dead, but there were still a few holdouts in the buildings and in the corners. The guys in the corners weren't too much of a concern, because I had enough deads to generate new units to attack them with. Digging the footmen out of the houses was going to be tough, though - or so I thought. 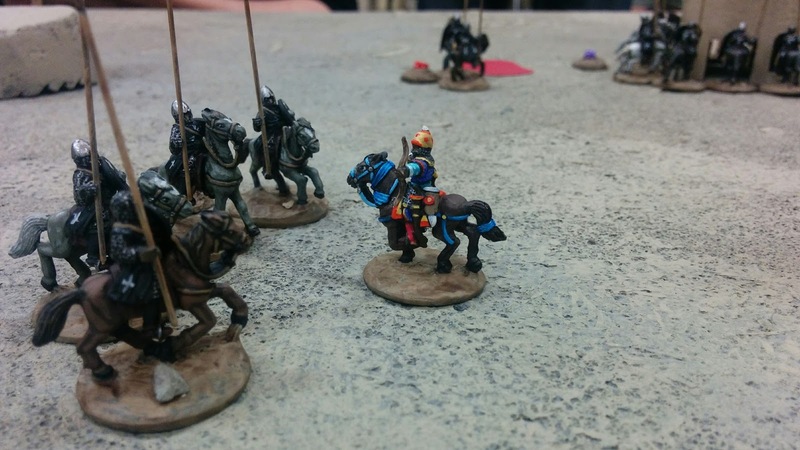 I sent my mounted Sergeants against the last holdouts of Dave's warriors in the north buildings, and they were able to get most of the job done. I brought in a new unit of Hearthguard in the East to kill off Grace's remaining princess and her leader, which they were able to do. After, they turned to the remaining footmen in the house and finished them off. So the game was pretty much in the bag! 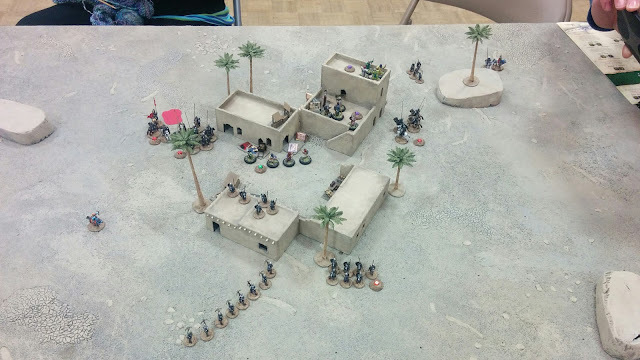 There was just the one wimpy archer remaining out of the entire Saracen force, the last survivor of the first unit I attacked at the start of the game. 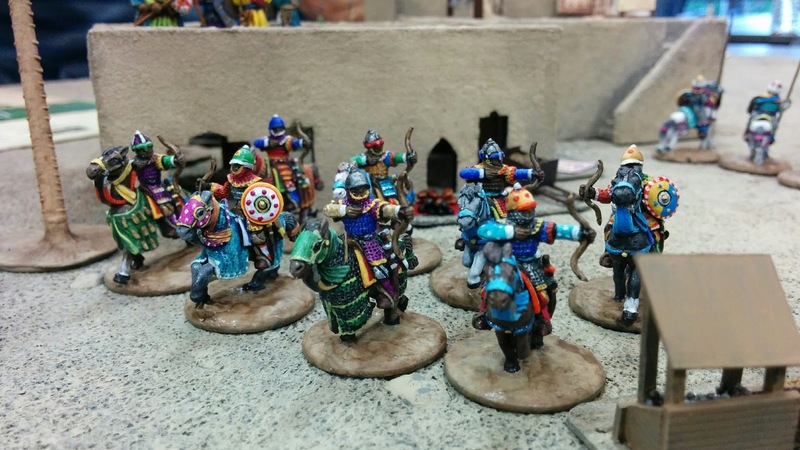 I brought in a new unit of Sergeants from the west to finish him off. ...and they couldn't! The Sergeants couldn't get that one last kill and finish off the only Saracen figure left on the table. I think some demotions are in order! 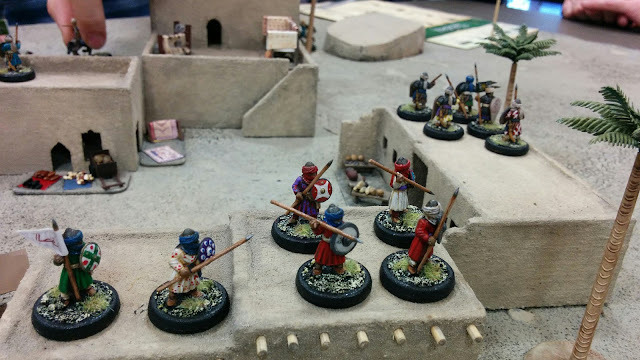 So, at the end of the game, the Hospitalliers were unable to achieve their victory condition of killing every Saracen figure on the board, so victory went to the Saracens! Here are some photos of Grace with the undisputed hero of the day. This was the closest game of Saga I've played, and probably the most fun. Impressive looking game. 15mm looks great like this. Haha. Great write up. It was a little ambiguous if my leader was the jerk, or I was =P. Thanks for the link, I noticed a spike in views and wondered what was the cause. 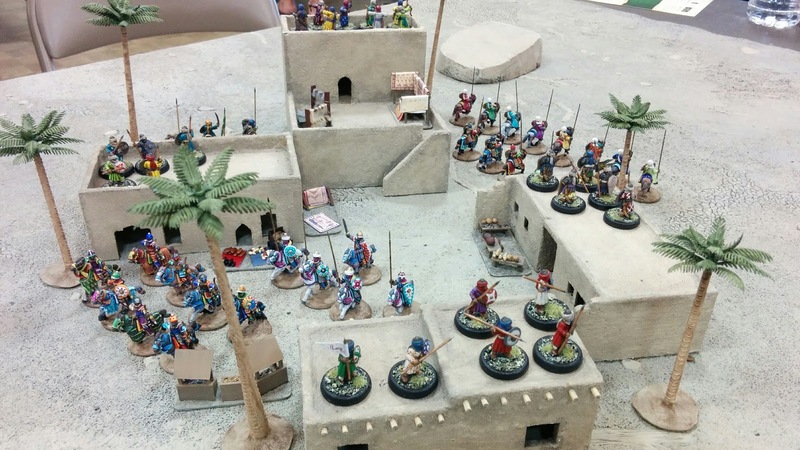 Beautiful figures and terrain, and greatly engaging write up. Thanks for posting. Might have to 'borrow' some of your painting ideas for my own LH figures. What did you use for banners and pennants, if I may ask? They are outstanding (in both senses of the term!). 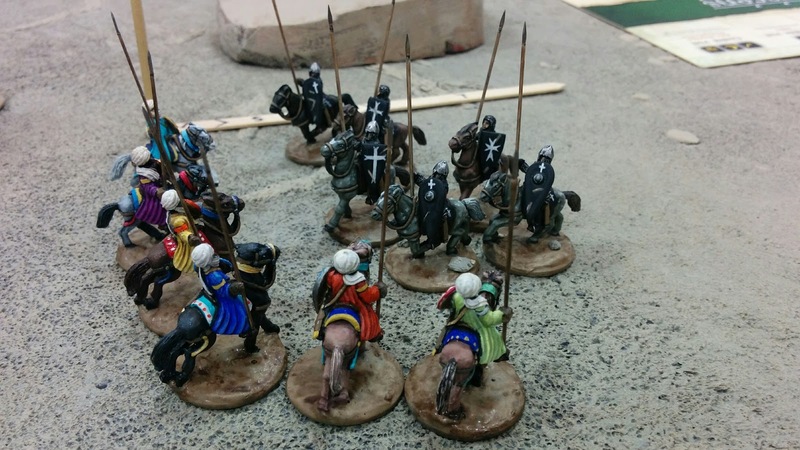 The flags are all thick textured paper, painted, with a coat of gloss varnish and then matte varnish. They are pretty robust. Did you know you can create short urls with Shortest and make money for every click on your short urls.